Anger is a natural response to feeling threatened, insulted, deceived or frustrated. Of all the emotions, anger is the one most likely to cause problems in your relationships with your family, at work and with friends. Anger, however, is important. Like all emotions it has a function - anger lets us know something needs to change. It provides the energy to protect ourselves or to make something different. Anger can be useful, but it can also be frightening. When we get angry, adrenaline causes the body to prepare for 'fight or flight', giving us energy and making us feel tense. Releasing this tension and energy can be healthy, but it can be hard to do in ways that are helpful. Fighting or running away ('fight or flight') often isn't helpful, and anger can often make things worse, not better. Being angry by itself isn't usually a problem. It's how we deal with it that's really important. We shouldn't try to 'get rid of' anger. Not feeling angry at all can be a problem in itself, while suppressing it might lead to problems later. If anger is a problem we can learn to manage it better. It's easy to confuse anger and aggression. Anger is an emotion, while aggression is a behaviour driven by anger. Aggression is something we do with the intention of causing harm to another person. Aggressive behaviour can be physical or verbal, or both. Alcohol and certain street drugs can make it far more likely we'll be aggressive when we feel angry. Anger can range from mild irritation to explosive fury. The more we're able to express our anger, the less likely we are to 'fly off the handle'. Some things seem to be universally irritating; sometimes the things that make us angry can be as individual as we are. We're far more likely to be angry if we're in a bad mood to begin with. Of course these things don't actually 'make' us angry; it's not a 'cause and effect'. We have choice about how we respond to our triggers. Take a look at the following list. Are any of these 'triggers' for you? Do you have any triggers that aren't on the list above? They might be things that happen to you (external triggers), or maybe they're intrusive or unwanted thoughts or memories (internal triggers). Write them in the box below. When we're angry or in a bad mood it can feel like the whole world is against us, every little thing confirming how 'justified' our feelings are. It's like looking through 'blame goggles' - we don't notice the good things, just the things that make us feel even angrier. Anger changes how we think, how we feel, the sensations in the body and the way we behave. It changes the way other people feel about us and behave towards us. It also changes the things we notice in the world around us. Table 1 below shows some of the ways we can experience anger. Take a few moments to think about feeling relaxed. What do you think, feel and do when you're calm, easy, happy and relaxed? Jot down your answers. We have a basic 'built in' range of emotions from very early in life. They seem to be 'hard wired', part of our biological make-up. People from all over the world experience them - they include happiness, sadness, fear and anger. From a very young age children can be seen to experience anger, perhaps when they are frustrated or blamed for something they didn't do. These 'wired in' emotions are called primary emotions. Anger is one of the primary emotions. As we grow, we find that some emotions are more 'acceptable' than others. Parents, teachers and friends show us that we can't simply shout and lash out when we feel like it, we can't sulk when frustrated or refuse to cooperate with others simply because we don't want to. Different societies and different cultures have different ideas about what's 'appropriate' to feel and express. Everyone's situation's different, some families want their children to be 'tough' so they discourage crying. Some want their children to be 'sweet' and popular, so they discourage expressions of anger or moodiness. For adults who were brought up to be 'tough', expressions of anger may cover feelings of fear or self-doubt. Sometimes we might look and feel angry, when our primary emotion underneath is one of fear or shame. For people brought up to be 'nice' or 'polite', it may be hard to express anger. Smiling and politeness may cover anger and resentment. Anger may be expressed as passive aggression - stubbornness, negativity or lateness for example. Our thoughts, emotions, sensations and behaviour can reinforce one another. 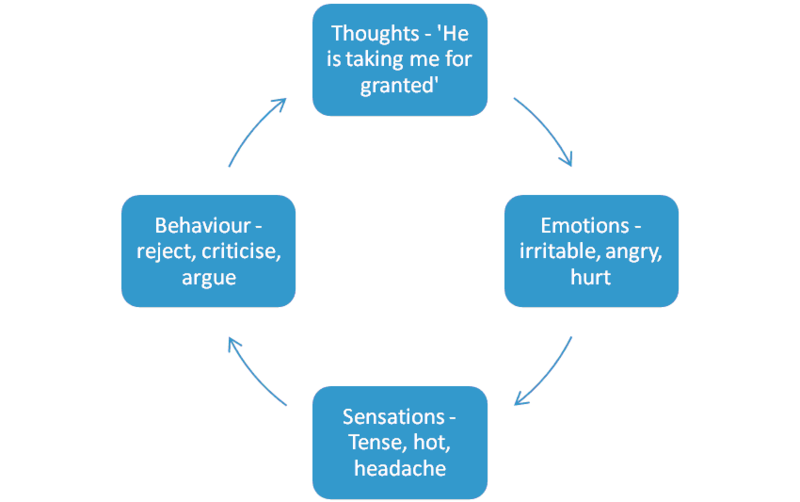 Figure 2 shows how the idea of being 'taken for granted' can result in hurt and angry feelings, leading to physical tension and relationship problems. 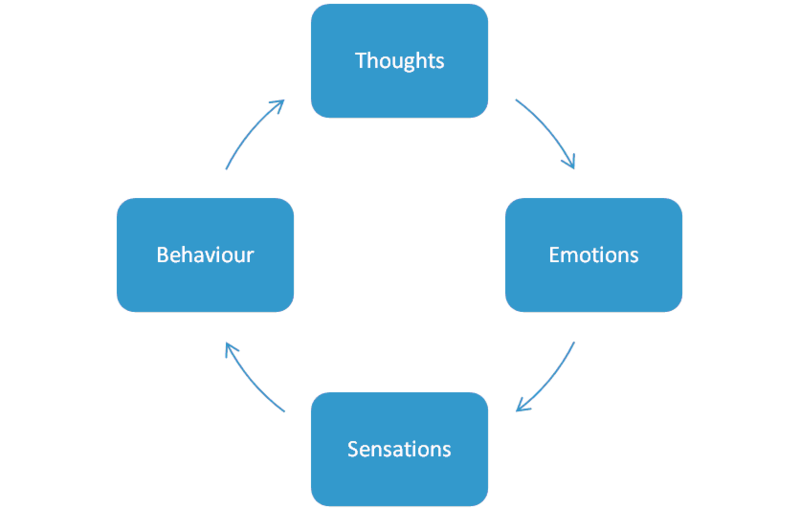 Because these four areas - thoughts, emotions, physical sensations and behaviour - link together, changing any one of them can begin to 'break the chain' of anger and help prevent anger leading to aggression. What's sometimes forgotten is that anger, expressed properly, can actually reduce the risk of violence. Anger drives assertive behaviour. It can help resolve conflicts, rather than lead to bottled-up resentments exploding at some time into violence or aggression. Being 'anger literate' means we have a wide range of responses when we feel angry - from feeling mildly irritated, through assertive behaviour, into respectful challenge and confrontation. It's when we seem to jump from irritation to rage with little in between that we gain a reputation for being unpredictable, bad tempered or scary. There are two types of aggression - impulsive and instrumental. Impulsive aggression is a spur-of-the-moment reaction to something we see as a threat. It is unplanned and reactive, it's often associated with stress and its goal is to reduce unpleasant sensations and emotions. Instrumental aggression is purposeful aggression. It's used to pursue more long term goals and is associated with callous personality traits, with a lack of guilt and empathy. The goal of instrumental aggression is often the control of people or situations. A little anger can help us be taken seriously, to stand up for our rights and the rights of others. However, this usually only applies to very tiny amounts of anger - anger is a bit like strong chili powder. A little bit is plenty - too much makes things worse. 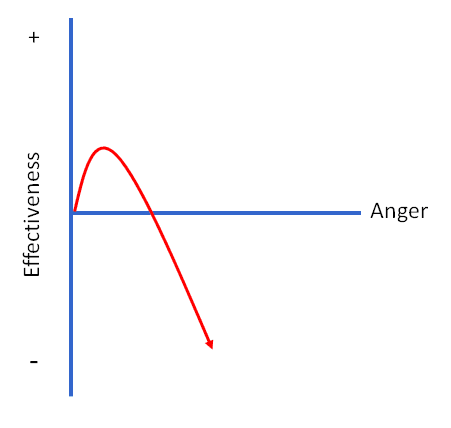 Figure 3 shows how anger can very quickly make us less effective, because people get frightened and think badly of us when we're too angry. Angry feelings can lead to destructive and violent behaviour. If we express our anger through aggression or violence it can be very frightening and damaging for other people - especially children. This can damage our relationships and mean that people stop listening to us. We could be sacked or get into trouble with the law. Our emotions work like a bucket slowly filling up with water. Too much and it overflows. We can take hurts and frustrations for a long time, sometimes years, but unless the bucket empties it will probably overflow at some point. We obviously don't want the bucket to overflow with anger. Mostly we find that anger seeps away over time. It takes some people longer than others, but it does eventually subside - thankfully the anger bucket 'leaks'! Problems start when we fill up the bucket more quickly than the anger can leak away. 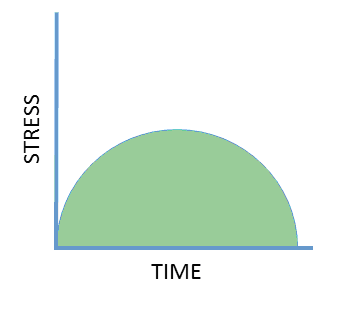 Figure 5 shows how our stress level rises, then falls again in response to something stressful - maybe an argument over breakfast. People differ in the time it takes for them to 'cool down' after a stressful event. Problems start when one stressor follows another. Figure 6 shows how another stressful event comes along before we've had chance to cool down after the one before it. An argument over breakfast, problems getting the kids to school, a difficult commute, conflict with the boss - they all add to our level of stress. 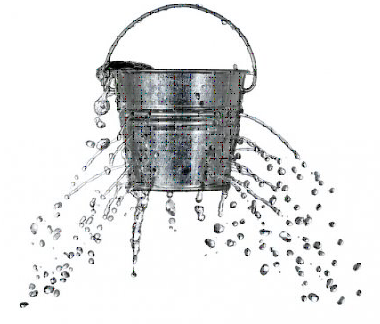 In this way our 'anger bucket' can fill up over time, unless we do something to help the anger drain away.